More blunders by the beleaguered UK Border Agency allowed up to 50,000 bogus students to enter Britain illegally, a damning report has revealed. Flaws in the student visa system were exploited by migrants coming to the UK for work, according to the National Audit Office (NAO), a public spending watchdog. Now furious MPs are calling on the UK Border Agency (UKBA) - already condemned by ministers after a catalogue of mistakes - to "get a grip" and fix the way it deals with student visas. "This is one of the most shocking reports of poor management leading to abuse that I have seen," said ex-Labour minister Margaret Hodge, who chairs the Public Accounts Committee of MPs. The NAO report reveals the points-based system was set up without key controls, potentially leading to tens of thousands of migrants entering the UK without any checks as to whether they were attending a college. The auditors also found the agency did little to ensure foreign students leave the UK when requests to extend their stay are refused. Condemning the latest failures, Ms Hodge said: "It is completely unacceptable... The agency has done little to stop students overstaying their visas. "And it is extremely worrying that the agency does not know how many people with expired student visas are still in the country. "It should be a real wake-up call to the agency that the NAO were able to track down 147 migrants who are probably here illegally within a week at a cost of only £3,000. The agency needs to get a grip and fix the way it deals with student visas." The latest fiasco comes only weeks after Home Secretary Theresa May split the UKBA in two after another damning report revealed how thousands of foreigners entered Britain without proper checks. A report by an independent watchdog, John Vine, found up to 500,000 Europeans arriving by Eurostar had not been checked, fingerprint checks were axed 482 times in under 18 months and machines to check biometric chips on passports were turned off nearly 15,000 times in under six months. Revealing the scale of the student visa chaos, Amyas Morse, head of the NAO, said the flaws in the system for people applying from outside the European Economic Area (EEA) were "both predictable and avoidable". Mr Morse said: "The agency regards students who do not comply with their visa conditions as a low priority compared with illegal immigrants and failed asylum seekers, and is slow to take action to deal with such students. "Action planned by the agency to ensure that those with no right to remain in the UK are identified and required to leave must now be pursued more vigorously." 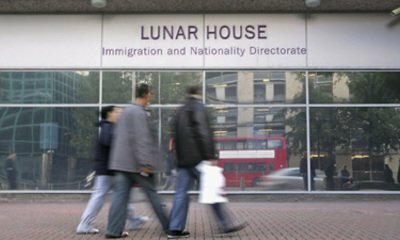 The NAO found the border agency withdrew entry clearance officers' powers to test applicants' intentions before it had controls in place over sponsor colleges. As a result, between 40,000 and 50,000 people may have entered the UK to work rather than to study in the year after the new system was introduced in 2009, based on college enrolment rates and changes in patterns of applications and refusals. "The agency has taken insufficient action to remedy the consequences of these control failures and has not dealt efficiently and effectively with overstayers and students working in breach of the rules," the report added. The watchdog's report also showed 62,000 notifications were sent by sponsors to tell the UKBA that students were not attending college between February 2010 and October 2011 but just 2,700 students and student overstayers have been removed since April 1, 2009. A total of 141 sponsor licences have also been revoked. Overall, some 292,000 visas and 110,000 visa extensions have been granted to students and their dependants each year since the new system was brought in, with a net cost of £19m from £244m in fees against £263m in processing costs. Condemning the blunders, Sir Andrew Green, chairman of the Migration Watch UK campaign group, said the watchdog had "lifted the lid on a scandal to which we have been pointing for several years". "This report is a shocking indictment of the student visa system introduced by the previous government," he said. "The NAO estimate of 40,000 bogus students in year one confirms all that we have said about the system being wide open to abuse. "We renew our call on the coalition Government to re-introduce interviews to weed out bogus applicants before they come to Britain as the Americans and Australians are already doing." Keith Vaz, chairman of the Commons Home Affairs Select Committee, said the findings were "yet another example of incompetence at the very heart of the UK Border Agency". His committee had continually warned the agency of the dangers posed by bogus colleges and students, he said. "I hope the decision to detach the UK Border Force from the UK Border Agency will now allow it to focus on its main task of ensuring migrants who come to Britain are genuine," Mr Vaz added. But Immigration Minister Damian Green hit back, saying: "This Government has introduced radical reforms in order to stamp out abuse and restore order to the uncontrolled student visa system we inherited. "These include tough new rules on English language, working rights and dependants to ensure only legitimate students come to the UK. "New restrictions on post-study work mean that all but the very best will return home after study." "These measures are beginning to bite," added the minister. "We have already seen the number of student visas issued drop considerably in the second half of 2011, compared to the same period in 2010."